THE NEW YORK STL CARDINALS FANS WANT YOU GUYS TO KNOW THAT WE ARE STILL WATCHING AND CHEERING YOU GUYS ON. YOU GUY’S ARE DOING GREAT. TO US THE CARDINALS ARE #1. Any comments on the pine tar allegations? If you guys weren’t playing a great team, it wouldn’t mean much. 2 single teams are left playing in the divison, and the Cards are it! How exciting that is to still be playing ball and it’s almost November. Your team is doing somthing right, I can say that. It does require not only the team, but the strategy behing the game to make it all roll into one. J-Rod, Weaver pitched well, but unfourtanately no one can seem to figure out Kenny Rogers right now. Hang in there, because you’re comin’ home to the best fans in baseball. You and your teammates are far from finished, and we all have faith in the team’s ability to bounce right back. Carpenter and Suppan are up next, and the fans will love it. Keep it up, you’re going to win this! Go Cardinals! If it was pinetar wouldn’t it still have been sticky after he washed it off? Good luck with the rest of the series. I’ll be out there cheering for you in game 4. It was either pine tar or “tincture of benzeine” a substance I used as a pitcher to callous the skin so as not to get blisters on my pitching hand. It’s sticky and you can’t wash it off at least not completely. That is why Rogers hand still looked green after he washed them. He was using it to help him control the ball and that’s a violation of the rule period.The rule states any foreign substance on the hands calls for immediate ejection and a ten game suspension. It was either pine tar or “tincture of benzeine” a substance I used as a pitcher to callous the skin so as not to get blisters on my pitching hand. It’s sticky and you can’t wash it off at least not completely. That is why Rogers hand still looked green after he washed them. He was using it to help him control the ball and that’s a violation of the rule period. John… This is from your two trucker buddies out here on the road as usual. We have been lucky so far and were able to see the games. You tell them boys not to lose heart, You all are the best and you are coming home to play before a city that loves you all. There is nothing better than that.We are so proud of each of you.It is so great to see Rolen and Edmonds doing so well.The boys are back! We are trying to get to STL for your 3 games,maybe we will make it, either way we’ll be watching and cheering and loving every minute of it.Bring it on home guys. Tip your hat to my Jim for me as always. Oh yeah Grandma told me to say that “Chris Duncan is a fine specimen of a man”.That was her exact words. She is 76 and a diehard Cards fan.We love you all and God Bless…..WE LIVE FOR THIS!!! You guys are heading home and will do awesome with Chris on the mound…and Supp the next night. It is going to be awesome! You guys are going to do just fine. Just remember St. Louis fans are the best in the world and truly love our team and the game of bseball! Go Cards! Wish I were still in STL and able to get to Games 3, 4 & 5, but unfortunatley had to return to Australia and work last week. Loved the opportunity to see the guys live in action and will be following closely on Gameday Audio with Mike Shannon & John Rooney when Game 3 starts here a little after 10am on Wednesday morning. Go Cards and Go Jim Edmonds!!! That’s sad that cards fans, cards players, and cards announcers all try to make dirt look like pinetar.face it nobody(yankees,As,or cardinals)is going to hit off of kenny right now stop trying to take something away from his pitching effort.Fox should have replace Tim McCarver with Ernie Harwell at least that way it will be a cards and a tiger announcer instead of someone just bitter he made the final out in the 68 world series.Kenny is a great guy and to try to make him look like that is horrible. J-rod – Great game – Rogers is lights-out in the post. You guys sent a message in the 9th that their bullet proof pen aint so bulletproof. Pine tar or tincture of benzene – Rogers should have been tossed. It was a foreign substance – you could see him repeatedly blowing in his hand while his finger tips contacted the goo (it gets stickier when yoiu heat it up). The umpire crew didn’t stand up and do the right thing. They let him slide and clean up – wrong message to send. As for the comment from Rogers that it was dirt -BS all the way. 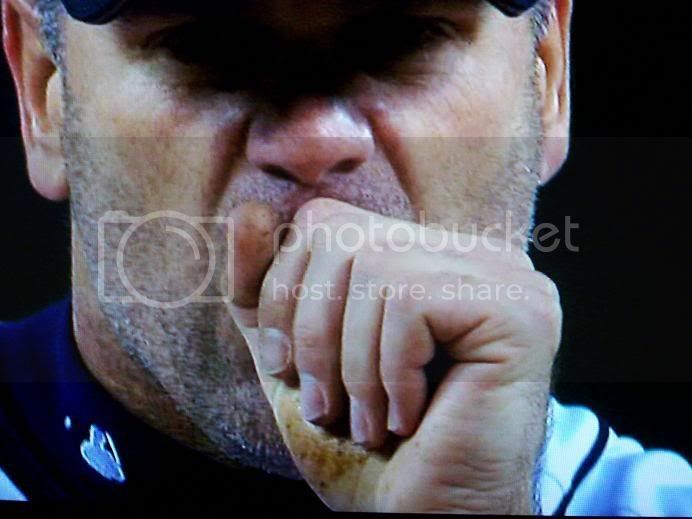 I think the next time he goes out, the crew should be allowed to check his hands before and after every inning. If I were them, I’d feel duped and stupid. Hi John, you guys are going to be OK, we showed them in the ninth, what you are capable of. It is just a shame such a great event as the world series has to be marked up with a dirty player like Kenny Rogers, sure he did well the whole game, but cheating is cheating, what HE failed to realize he pitched so well he didn’t even have to cheat, that makes for some bad carma, people should r be real careful what they wish for. He should have been yanked out of the game..Oh well it only fuels St. Louis Cardinal baseball’s fire, so go out there Tuesday and show them what your about. Go Cardinals! John, last night was a travesty, but the Cardinals can play through that. Please let everyone in the clubhouse know that the fans are angry about it but that we don’t want them to lose focus. Keep your eyes and minds on that trophy. Think about bringing it back to StL after 24 years. This was the year the media said you all shouldn’t do it, but you can! Keep your eye on the ball, play clean games and do what Cardinals do best – Amaze Us. At this level, there is no luck, only effort and determination. I LOVE THIS TEAM, EVERY ONE! 1. I remember Julian Tavarez getting tossed a couple of years ago for a suspicious substance on his cap, too bad the same rules don’t apply to Rogers. 2. Weaver pitched awesome, gave the Cards a chance to win. I think the Cards bats were a little too anxious, chased too many out of the zone. 3. That last at bat . . . wish Yadi had laid off a couple, I think Jones was struggling. Either that, or I would have loved to see a lefty bat come in. Hindsight is 20-20, right? 4. Next 3 games . . . advantage, Cards. I feel a sweep coming on. GO CARDS!!! Here’s my theory on last night. 1. Kenny Rogers cheated. The announcer even mentioned in the seventh inning that he still had his glove on in the dugout – talked about how strange it is for a pitcher to be wearing his glove in the dugout. He should have been ejected in the second inning and then the series would be saved the controversy. Darn Kenny Rogers for adding the preverbial “astrick” to this fine matchup. 2. One of these days, Weaver is going to get to pitch a game when the Mighty Red Bird Bats are hitting. Every game he has pitched has been that much tougher. All in all, I think he did a fine job and I’m thrilled that he’s a Cardinal in this post season. Welcome to the team, Jeff! 3. In the top of the 9th, when the bases were loaded…at that point, I don’t care what happens. We split the series in the Detroit, we did what we HAD to do. I think Yadi got a little excited and impatient, didn’t wait for his pitch. That’s OK, Yadi – you will get your pitch at home and you can give us another one of your famous post-season clutch hits in a stadium where the fans will actually appreciate it! All the boys need is to come on home. It’s been a long time since they’ve been home – alot of things have happened – it will be soooooo nice to have you all home!!!!! It ain’t over till the fat lady sings – and the fat lady isn’t even stirring. It was great to see that in the top of the ninth down by three with two outs that the cardinals never gave up. That alone makes the cardinal fans proud. We play a best of seven series for a reason. You have more than one chance to win this. Continue to play hard and no matter what the situation is Don’t Give UP. Go get’em Tuesday night. GO CARDS!!! Great job in Detroit – coming back to STL with a win is wonderful. Too bad Kenny “Cheater” Rogers didn’t get kicked out for the pine tar. And now we see that he’s been using it the whole postseason. His stats should have a (*) beside them. Oh well, they’ll get what they deserve at Busch Stadium. Go Cards! Tell the guys we are so proud of them here in STL and we believe that you guys will go all the way and be the champs. Don’t let another pitcher make you all forget the talents that all of you have. Don’t let that happen again. Our team has proved all the stupid critics wrong and continues to do so. At least it is warmer here in St. Louis!! Welcome home. Now tell the guys to finish it. May God bless all of you!! keep the focus on the tiger’s. it was just a shame that kenny’s poor judgement will scar a great series. it doesn’t take a baseball guru to figure out that the guy with the WORST era in post season history (20 runs in 20+ innings) magically becomes dominate and is on the verge of a MLB record for scoreless post season innings. gimmie a break! let’s just put it behind us and take it to the tigers on our turf. I think we see now the secrets of Kenny Roger’s success. The Gambler had an Ace up is sleeve (or “palmed” in his hand). But now the series swings back to STL. Make the world forget about KR. A regrettable incident in the Cardinals 5 game World Series triumph! Go J-rod! Go Cardinals!!! It sounds to me like (concerning Kenny Rogers) it is just an excuse, instead of we just got beat by a better team tonight. The players are not using it as excuse why should the fans. Besides the first inning was his worst inning of pitching so how do you all explain that??? I was just watching sport center and even if it was something being on the palm practically on the wrist would not be a gripping advantage. For it to be a gripping advantage it would have to be on the finger tips. All sounds like a lot of excuses to me. Great job guys on getting a split against a great team!! I’m not one of those people that makes excuses but rules are rules and in this instance the rules were not followed. I’m sick of everybody making Kenny Rogers look like a hero. How quick we forget that this is the man who just last year shoved a cameraman to the ground. Let’s quit glorifying all of these athletes that are controversial just because they have a couple of good games. We need to concentrate on the role models we have in this great American game. Other than that, to all Cardinal faithful that get the opportunity to go to game 3,4,5 make us proud like always. Bring the noise!!!! If last nights game told me anything. it is that the tigers are depending alot on Kenny Rogers. After all the tigers were beaten when you guys were using one of your newer pitchers. Now your goin back home to St. Louis, with Carpenter pitching. This next game should be great. Just to let you know your fans here in Idaho are are behind you guys 100%! Good luck tomorrow! What can I say? I was hoping for 4 straight wins but then baseball would be over for the year and I am not ready for that! You all really tried last night. I would of love to see you hit against Rodgers as I think he is very aragant ( mispelled ). There was something on that hand and I give Tony and his crew points for not going on about it. In my books, he should of been out of there. Rolen and Edmonds are coming through just when we need them. Now let’s get David going. He tries so hard and can do it! Missed Belliard but Aaron did a fine job. We can only hope they will pitch to Albert but got my doubts unless they are force to. Wouldn’t it be great to see bases loaded and Albert up with a home run in his bat. Good luck Tuesday night. I’ll be watching here in Quincy,IL. You are right. It didn’t matter. True Cardinals fans don’t even care, even though Julian Taveras was ejected for haveing dirt on his cap!! a couple yearts ago. Kenny pitched a great game. What is said is how low it brings the Tigers great reputation. First he trashes a camera man, then he tries to humiliate every team on the mound….. not with his pitching but with his childish emotional demonstrations, then he puts himself in a position where he was quite likely cheating. Jim Leyland, Polanco, Guillen and all the other classy people in the Tigers organization deserve better. Why don’t the fans and the players and management take care of the matter. Come out and at least reprimand him. The game stands. But Tiger pride sinks low without it. We true Cardinal fans just want to let you guys know that we are so proud of everything you have done so far this year, and we know you will win this series. We support and believe in every single person in this lineup! Everyone is a true example of greatness, class, and sportsmanship. Good luck in St. Louis!!!! WHEN WILL MLB LEARN??? When controversies are faced head on it is best for all involved. Shame on everyone, especially Rogers, Leyland & Larussa, for not insisting on the “substance” being identified & appropriate action being taken. Rogers is a great pitcher, but not even the best should be given a free pass when they do something questionable. If it was really dirt, Rogers & Leyland should have wanted it sampled & officially noted so as to avoid any more speculation & Larussa should have insisted. It is ashame major league baseball is content to let things go so easily. It casts an unfortunate shadow on the entire game. AT ANY RATE…GO CARDS!!!!! We lost one, it’s a shame, but we will win in the end…after-all we are talking about the CARDINALS, they are full of wonderful suprises! I can understand the frustration from many people as to why the Cardinals, particularly LaRussa didn’t insist on some action being taken against Rogers, or at least to prompt further investigation. However, I tip my hat to LaRussa and the Cardinals organization for not throwing a fit about it and leaving fate to be determined on the field of play. If Rogers had a foreign substance on his hand, then absolutely steps should be taken to enforce the rules, but no one but him knows for sure now. Nonetheless, a tip of the hat to the Cardinals and Manager LaRussa for not stooping to a lower level and on continuing the classy style of baseball that has typified the Cardinals organization throughout its existence. GO CARDS!!! THIS IS OUR YEAR!!! You guys get a good night’s rest tonight. Tomorrow is a new day and tomorrow evening you will be in front of all your devoted fans. I will be watching from my livingroom in St. Louis! Go CARDS! I have been a Cardinal all of my life and I always will be. But basball is a business and in a business you try to win at all costs. My comment is this..when LaRussa benched Rolen for not hitting well why doesn’t he do the same thing with Encarnacion and put someone out there in Right Field like Taguchi or you yourself, his playing time at the plate is costing us…i take that back its killing us. There is no “I” in team, so lets hope LaRussa see’s this and puts someone out there or at the plate who could do us some good, maybe a change would wake Encarnacion up and make him realize that he better start making better swings at the plate! Thanks and lets bring the World Series title back to the Gateway City of the Mid-West….St. Louis baby!! Even though you guys lost last night, look at the bright side. Weaver did good, and now you guys will be coming home to St.Louis. What ever happened to the pine tar on Rogers hand? Let’s bring our A-game tomorrow and finish this series off in St.Louis. Make us proud, we all love you in Cardinal Nation. John, I definately have to agree with gasko. Juan is killing us. I do not understand the reasoning behind keeping him out there when we have other great players like you to replace him. I never like to doubt La Russa and I am sure he has his reasons but every fan I know wishes he knew what those are. As a player Juan should know that his non-performance is hurting the team and sit out of respect for them and us fans,I feel terrible for thinking this way but something should be done. Sorry for complaining,Now all ya’ll get a good nights rest. Dreams do (and will)come true! I’m disappointed we haven’t seen you PLAY this postseason. A split in Detroit was pretty good, but I’m pulling for my CARDS to come out and play like we know how here at home. Im a TIGERS fan. there was something in Kenny Rogers hand……it was a BASEBALL! and when he threw it he made the cards look silly! he got pooholes, then he got molina, then he made speezio and carnation look silly. expect more of that from the greatest pitching staff in the majors! GO TIGERS!! You guys with the birds on the bats on should be pumped up. For me this is one of the greatest times of my life. I grew up with Jack and Mike on the radio, and I would love nothing more than to see you win the World Series of baseball. Keep up the good work. We all bleed cardinal red here in Edina, Mo. GO CARDINALS. Ok- as a Tigers fan, I have to chime in. I have no idea what Rogers had on his hand, but there has been so much said about it and the fact that there are (gasp!) Cardinals pitchers who use “foreign substances” as well and that’s the reason no one could really complain. Should he have been tossed? Maybe. But that’s something for the umpires to take care of – and Steve Palremo was there. Should the game have even been played with the freezing rain and awful wind chill? The temperature was posted as being in the 40s, but as one of the people pelted with sleet on the way in last night, it was probably 10 degrees below the posted temperature. As a real baseball fan, I am happy to see a Tigers/Cardinals matchup. Having 2 original teams and with the friendships between the managers and a lot of the players, it’s a great story. I even talked about this the other day when I was interviewed for British television (though I said the thing with playing the Mets would have been nice to beat up on the other New York team). You have a great new stadium and a great city. As someone who attended the last 2 games, (and it was FREEZING last night), enjoy the games you will host. If you are lucky enough to attend, soak up the atmosphere. It’s been great here and I’m sure you will enjoy it too. It seems pretty obvious Tony had learned of Rogers’ cheating, but waited until the end of the inning to do something about it. By then, it was too late. He should have walked onto the field with an umpire and examined Rogers’ hand. In addition to getting Rogers thrown out for the rest of the series and forcing a bullpen game by the Tigers, it may have salvaged yet another anemic at bat by Encarnacion. I’m not a Tony hater. I almost always give him the benefit of the doubt. But this time he blew it. His innaction cost us game 2. Tony wanted the pine tar removed from Kennys hand, but did not want him ejected. The Cardinals do not want to win with a key player for the Tigers being ejected and susp. It was only 1 game, its tied 1 to 1. We have Carp and Supp pitching the next 2 games. We have a very good chance and should probably win both games. If that happens we wont here anything about Rogers. Even with all of that the Cardinals still had a chance to tie and poss. win it. Duncan should have batted for Juan, and J-Rod for Preston. That would have given us a better chance. J-rod you need to talk to Tony and get him to play you instead of Loping Juan in right. Juan turns more singles into doubles and doubles into triples than anybody i have ever seen. And it appears that he is not seeing the ball very well(understatement). Good Luck. Go Cardinals, Its your year!!!!!!!!!!!!!!!! St. Louis is associated with one of the biggest cheaters in the game… Mark McGwire. Remember that while perched up in your Big Mac Land at the new Bush Stadium…. John, Us loyal card fans that have been going to almost all your SUnday home games , managed to score tickets to Thursdays game. You guys would make my year if you’d close up while we are there so we can be in St louis while you guys celebrate on the field. If you do win it all on Thursday please include the fans in on your celebration like the tigers did when they won the ALCS. I’ll be watching David’s back! I thought about not posting any comment on the whole subtance in hand issue, but then after reading some of the other posts decided to go ahead. I applaud Tony for taking the high road and not having the other pitcher ejected from the game. But it will put him (the other pitcher) on notice that his hands will be closely monitored from now on. What I do object to is the insult to my intelligence in saying it was “just dirt.” I may be a lot of things, but blind is not one of them. It does not matter what players have done in past games, two wrongs never make a right, what does matter is what is happening right then. If a pitcher is good at what he does, there is no need for questionable enhancements. And by all accounts the man in question is a really good pitcher, so shame on him for stooping to something like that. Shame on anyone who does. I am glad you all are home now and I will be glued to the tube tonight cheering you on. I do have agree with some of the others about Jaun, he is just not on his game and something needs to be done. I am so proud of Molina and his hitting of late. You know the talent is there, it just needed to be brought out. As a catcher he is totally awesome. I hope Eckstein (or wormie, as he called around our house)gets to hitting again. We could always count on him to get that lead off base hit and I know he won’t let us down at home. Looking for win #2 tonight!!!!! Kenny rogers = cheater! If you listen to what Jim leyland said and compare it to what kenny rogers said, it just doesnt add up. Not to mention what the umpires comments were post game about what happened. Lies, cheating, and scandel is what everyone will take away from this world series. No need for an (*) next to his name. Everyone will look back at this world series/post season and say the word they use for barry bonds. CHEATERS!!! It saddens me because i was pulling for the tigers up until game2. Now lets just hope that the saying “cheaters never win” holds true. But that is not what I cam on this Blog to ask. What is the weather looking like for the game tonight??? (Thursday, I mean) Is it looking like they might play ball tonight? ?